CECH: "If the club says, ‘You are staying here’, then I will be staying"
Petr Cech's demotion to number two behind Thibaut Courtois at the beginning of the season has had everyone talking. The player himself has taken time out to re-affirm the situation and state that his future remains in Chelsea's hands. Cech, who has been the focus of plenty of rumour and speculation linking him with a move away from Chelsea as early as January, has been quick to play down these reports. “Regarding my future at Chelsea, it depends entirely on the club. Everyone is asking me what if and what will happen. As a player, who has two years left on his contract, I cannot make the choice. It is simple. If the club says, ‘You are staying here’, then I will be staying. That’s why I’m staying. I can only leave if the club lets me go. And that is not the case. As a player with a two-year contract, I have absolutely no chance of influencing the wishes of the club. I am doing my best to change the situation. I want to play as often as possible and be prepared to be as good as possible for the fixtures what will come in the new year. 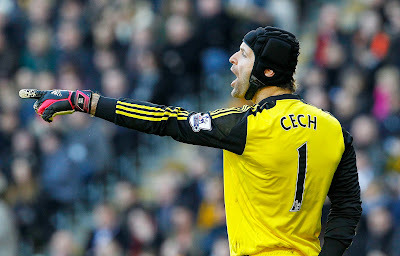 You have to commend Cech for his attitude. I'd imagine that it's not easy to be the number one at the club for a decade, to then lose your position and get used to life playing second fiddle! He says that his future is in the clubs hands and rightly so, but I just wonder if someone came to the club with an offer in January, what they would decide to do? It's obvious he deserves and has earned the right to be number one and someone, somewhere will feel the same way. Whether or not that will be in January or at the end of the season only time will tell. For now, he is keeping his mind occupied playing the odd game here and there and playing the drums on YouTube!